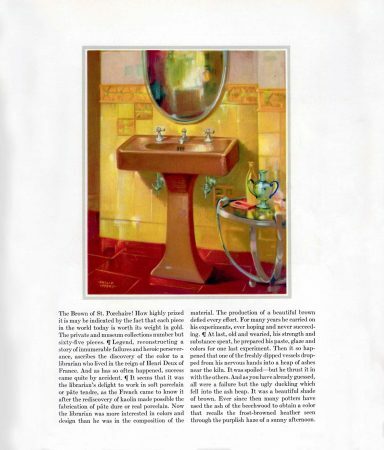 You might just say “This is a brown sink.” Obviously you’re not a 1920s copywriter besotted with the romance of porcelain bathroom appliances. 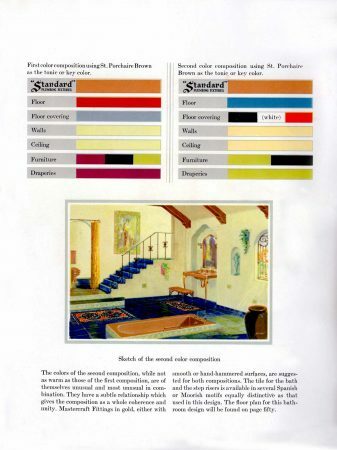 From Standard Sanitary Manufacturing Company comes this astonishing 1929 guide to bathroom design. Fifty-six gorgeously lithographed oversized pages on high quality laid paper, each chapter depicting bathrooms that a Hollywood set decorator might dream up for a wicked Pre-Code flapper. 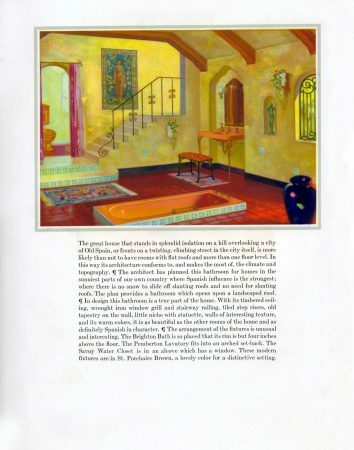 This particular example, practically the size of my living room, features art deco side tables, Mediterranean and Moorish accents, a bathtub sunk into the floor (! ), and steps leading UP and out to a rooftop view. 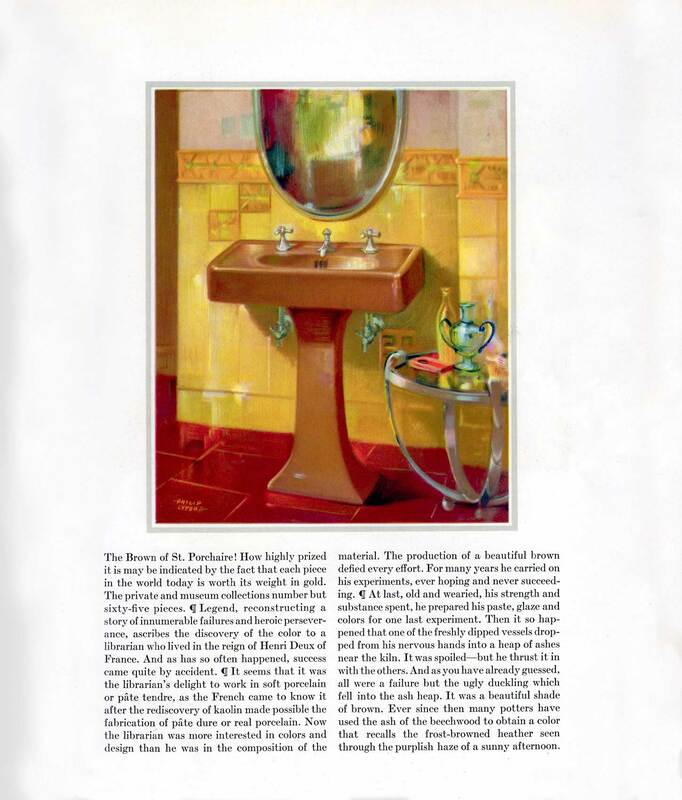 But no 1929 movie could capture the impressionistic, vivid colors the artist has painted, and few scriptwriters would match the breathless history the copywriter has given to the brown sink, bath, and “Pemberton Lavatory” (that’s toilet to you and me). Mind you, “Saint-Porchaire Brown” is not entirely a copywriter’s fever dream, but a basically true history altho’ embellished in the details. Other feverish colors included T’ang Red, Orchid of Vincennes, Claire De Lune Blue, Ivoire de Medici, Rose du Barry, and Ionian Black. You should click on the page scans and read the purple prose – excuse me, Royal Copenhagen Blue. I’d take a bathroom like this even today, much less in 1929. But just a few months after this was printed, the stock market crashed (October 1929), putting an end to most people’s aspirations to such luxury. Standard survives as a company today, selling nearly 300 varieties of toilets…and you know what? they come in White, Bone, or Linen. In other words, any color you want – as long as it’s white. Something’s been lost. Next Next post: How the other half pooped.